Apple announced iOS 8 for the iPhone, iPad, and iPod touch. Unveiled during this year’s Worldwide Developers Conference, the latest version of the company’s mobile operating system isn’t a complete re-working like iOS 7, but there are more than a few additions and refinements this time around nonetheless. With the magnificent design, iOS 8 brings great features to iPhone, iPad, and iPod touch users. However, if you’re not lucky, you might encounter data loss issues after upgrading your iPhone, iPad, and iPod touch to iOS 8. To get back your data, you need the help of a third-party program, one of the most popular software:UFUSoft Fonelab. 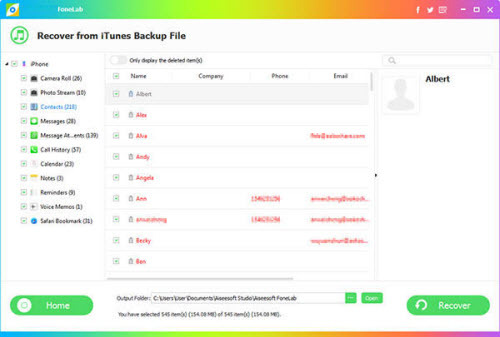 It can help you bring back your lost data whatever your device is iPhone, iPad, or iPod touch after iOS 8 upgrade. There are three ways for you: Directly restore data from your iPhone, retrieve from iTunes backup files in the condition that you do backup and recover from iCloud backup file. But remember do not Run iTunes during the recovery process to avoid your data being updated. UFUSoft iOS Data Recovery for iPhone/iPad/iPod Touch, which aims to solve data loss issues for all iPhone, iPad, and iPod touch users, is absolutely one of the best tools that you can get. It recovers all kinds of files lost after iPhone/iPad/iPod Touch iOS 8 upgrade, including SMS, contacts, videos, photos, call history, Safari bookmarks and more. 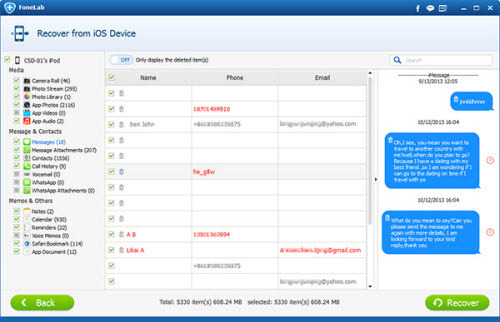 It’s a quite powerful as well as easy-to-use program that recovers data from iOS 8 devices. You can download the trial version of UFUSoft iOS 8 Data Recovery Software to recover iPhone, iPad, and iPod touch files now. If you happen to have a Mac computer, you can free recover iPhone, iPad, and iPod touch data with UFUSoft Free iPhone/iPad/iPod Data Recovery for Mac now! After launching the UFUSoft iOS 8 Data Recovery program on your computer, you will find three recovery mode options on the top of the window that you can choose. Now, let’s try to “Recover from iTunes backup File” and follow the detailed steps. All data of iTunes backup files will be found and displayed automatically, choose the one of your device and click “Start Scan” to go on. When the scan is over, all the files of your backup will be presented and listed to you. Before recover your data, you can preview them one by one. Mark the data you want and save them on your computer by clicking “Recover” button. Note: Then data still exist in your iPhone/iPad/iPod Touch and those already deleted are both found and displayed in categories here. If you only want to preview the lost ones, you can slide to the top of the window to click the button to only display the one deleted. If you lost your iPhone/iPad/iPod Touch data due to upgrade iOS 8 on your iDevice, you had better recover them by extracting the iTunes backup. According to this situation, you can not find all your lost data by scan iPhone/iPad/iPod Touch directly, because they may have already been overwritten by the updated system files. To avoid losing your important data again, make backup well is very useful for you to get back all your lost data. How to Play 4K Blu-ray or 4K Video on iMac/Macbook, macOS Sierra?